STATE COLLEGE, Pa. – Gone are the days in Happy Valley when Penn State struggled just to find five starters for the offensive line. Now, after making slow but steady progress the last two years blocking for the likes of Saquon Barkley and Trace McSorley, the unit is ready to demonstrate that it can rank with any unit in the Big Ten. With eight lettermen returning up front on offense, the competition for the five starting jobs this year figures to be fierce. 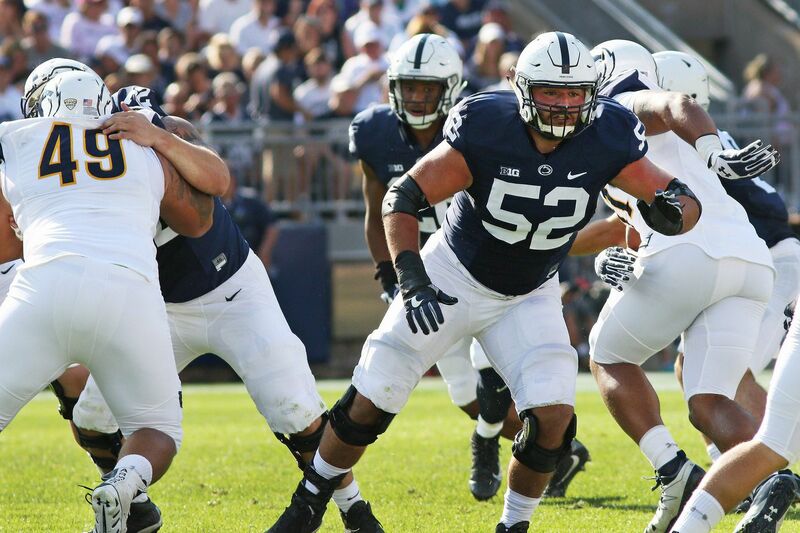 "Everyone is fighting for a spot," Ryan Bates, a redshirt junior tackle from Archbishop Wood High School, said Saturday at the Nittany Lions preseason media day at Beaver Stadium. "Besides quarterback, the offensive line is the most experienced group on the field, in my opinion. "It's exciting having this much experience. Multiple people on the team, more than five, have started before in games. Going through camp this year is going to be interesting." It certainly is a change from 2014, James Franklin's first season as head coach. Scholarship reductions left the Nittany Lions short of even a two-deep lineup on the offensive line. The offense struggled the first two years, then came to life with the emergence of Barkley and McSorley, and the leadership of offensive coordinator Joe Moorhead. Penn State averaged 41.1 points per game last season and rolled up a 460.3-yard average in total offense in going 11-2, closing with a win in the Fiesta Bowl. "I thought we made great progress last year," Franklin said. "I think there's still a difference between having a legitimate, Big Ten offensive line that we had last year, and being able to have an offensive line that allows you to compete consistently with Top-10 programs. We took a real nice step last year, and that's still what we're working toward. "I do think it's one of our strengths." It could be a real scramble for spots. Franklin has said that eight or nine members of the offensive line are good enough to start. Redshirt sophomore Michal Menet, a backup last year at guard, may end up as the starting center, shifting junior Connor McGovern to guard. A key for the offensive line is its versatility. The 6-foot-4, 305-pound Bates started at left guard in his first season in 2016, then went outside one position to left tackle later that year. He started the first eight games last season at left tackle, suffered a leg injury against Ohio State, sat out three games and returned as a right tackle. Bates said he started preseason camp back at left tackle. "I like playing," he said. "It doesn't matter what position I'm at. I just like to be on the field and competing." Despite the lineup battles that will continue through training camp, the Lions boast a unit that Bates feels "is the closest group we've had so far." And they all know that each has to be on their A game to remain in the hunt for starting jobs. "We all hold each other accountable," he said. "That's the most important thing, especially as an offensive line. We all have to hold each other accountable. I've got to trust what the guy next to me is doing on the field as much as he's got to trust me. So we all believe in each other and we all think we can accomplish great things this season."